The Chinese Crested temperament makes him one lovable dog indeed. Though, you need to handle this sensitive sweetheart with kid gloves. One harsh word too many can break his spirit. He’s kind of a like a kid at heart. He’s playful and innocent, and he trusts and loves his family unconditionally. 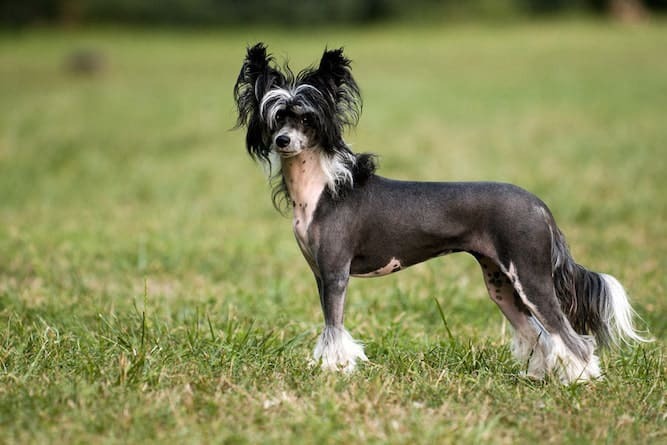 Perhaps one of the most interesting things about the Chinese Crested is that it probably didn’t originate in China! Some believe Africa is its birthplace, while others claim the Chinese Crested is a relative of the Mexican hairless. The “Chinese” in the Crested’s name likely traces back to their days clearing rats on Chinese ships. If you’ve ever had a child attach themselves to your hip, then you know the meaning of this phrase all too well. The Chinese Crested will follow his master to the moon and back if his master lets him. While the Chinese Crested is nice to children, you should refrain from adopting one if you live in a house with young ones. In addition to suffering an accidental injury at the hands of young children. The Crested can become jealous of the attention he’s not getting. This can cause him to snap or even bite. Because he barks at literally everything, he is a good watchdog. However, early training and socialization can teach him when barking is necessary and when it isn’t. Caring – He loves his master so much, he actually uses his paws to hug him around the neck! Sweet-Tempered – Because the Chinese Crested is such a sweetheart, he makes for an ideal therapy dog. Peppy – He never gets tired of playing with children or other animals. Alert – He barks at everything, which can be both helpful and annoying. Playful – He loves playing with his toys and dashing around his house and backyard. Happy – He loves being in the spotlight – in fact, he becomes a bit of a showman if he earns praise while in training. 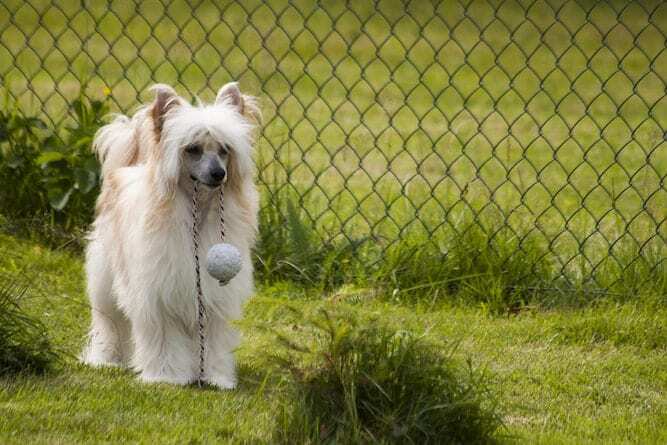 The sensitivity of the Chinese Crested temperament makes him a bit difficult to housetrain. This is one of those breeds that does not respond well to harsh scolding. In fact, the impact of such treatment can be more significant than to other breeds. If you’re too hard on him, you risk irreparably damaging your relationship with him. If he isn’t quite getting the commands you’re trying to teach, be patient. Instead of focusing on the negatives, reward him with praise or a treat when he does well. Just be careful not to go overboard on the treats to the point where he gains weight. 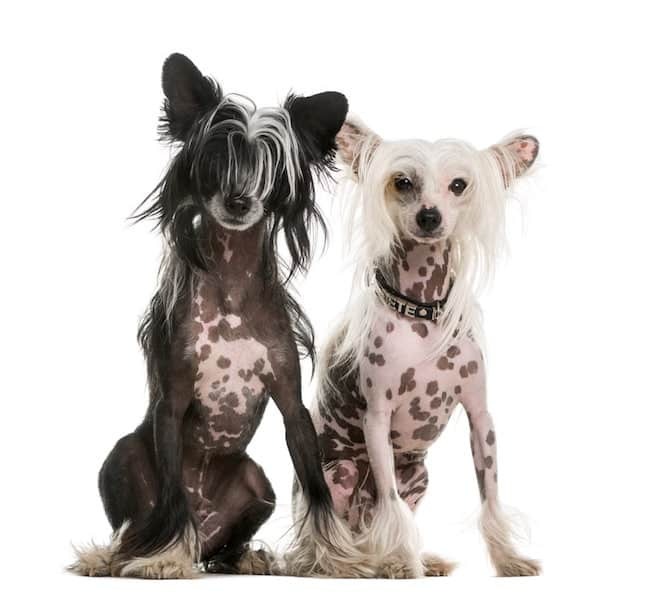 A healthy weight for the Chinese Crested is between 8 and 12 lbs. As for housetraining, make sure you don’t allow him many opportunities to have accidents in the house. Else, he will think this is acceptable behavior. You also don’t want to use “wee-wee pads” unless absolutely necessary. Indoor options may confuse him, so it’s best to take him outside every time he needs to go. Chinese Crested Hairless dogs are not excused from grooming simply because they have no hair. In fact, because of their exposed skin, this breed is more high maintenance than others. You must take care to ensure he does not develop skin infections or sunburns. He is also more vulnerable to developing an allergic reaction to certain materials, like wool. To groom a hairless Chinese Crested properly, you need to give him skin treatments appropriate to his skin type. You must also put sunscreen on him before he goes out, and use acne lotions when necessary. On the other hand, you need to brush a Chinese Crested Powderpuff dog every day to maintain his fluffiness. 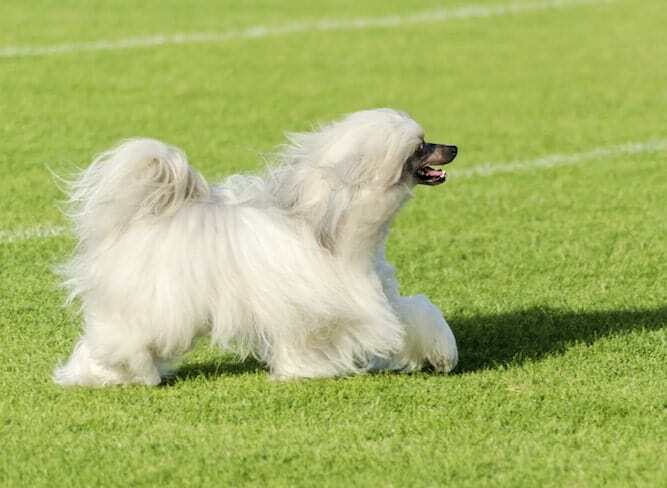 The Chinese Crested Powderpuff’s coat is easy to brush, but it’s also quick to develop mats. This is why daily brushing is so necessary. As far as exercising a Chinese Crested Hairless, he is pretty easy-going. All he needs are a few quick walks each day, or even a walk combined with some backyard play. He likes to be outside, but be sure to put sunscreen on him before he goes out. If you can’t find dog-specific sunscreen, Cesar says you can use sunscreen for kids or sensitive skin. The average lifespan of a Chinese Crested is between 12 and 14 years. However, many have lived much longer. Full-grown Chinese Crested Hairless dogs are between 11 and 13 inches tall. There are quite a few conditions that affect this breed that any prospective owner needs to be aware of. Many of these issues are congenital and present themselves in Chinese Crested puppies as young as 10 weeks old. It is therefore important that you find out all you can about a puppy before purchasing or adopting one. Are you convinced, after reading about how sweet the Chinese Crested is, that you need to add him to your family? If not think about what you read above. Also for more general info on the topic of choosing a dog: read how to choose a dog? If you are convinced that the Chinese Crested is the dog for you, then you have a few options. You can purchase a Chinese Crested puppy from a breeder. Or you can adopt a puppy or older dog from a rescue organization or shelter. Whichever decision you make, you must do your research on a Chinese Crested for sale before you bring him home. Of the utmost importance is finding out in advance if the dog has any health problems. This way, you can decide whether you want to take on the related emotional and financial burdens such a condition can bring. And, of course, it’s better to know than to have a breeder trick you into buying a puppy with problems. On average, the Chinese Crested dog price runs between $800 and $1,000. You can expect to pay a higher or lower Chinese Crested price based on the superiority of the dog’s bloodlines. If you would like to adopt a Chinese Crested, start by researching the local adoptions centers and rescue organizations in your area. Many organizations have their rates right on their website, along with the availability of a particular breed. If you don’t see a Chinese Crested at your local shelters, don’t lose hope. Keep checking back sporadically, and you may receive a reward for your efforts. To learn about what to expect and to prepare for adoption from a shelter read this. If you’re interested in a Chinese Crested dog for sale, a good resource to use is the American Chinese Crested Club. This organization specializes in promoting responsible breeding, so you can rest easy choosing a breeder from their directory. No matter who you choose, always be sure to research the breeder thoroughly. Run, don’t walk, from a breeder who doesn’t have any certifications, or who balks at answering questions. 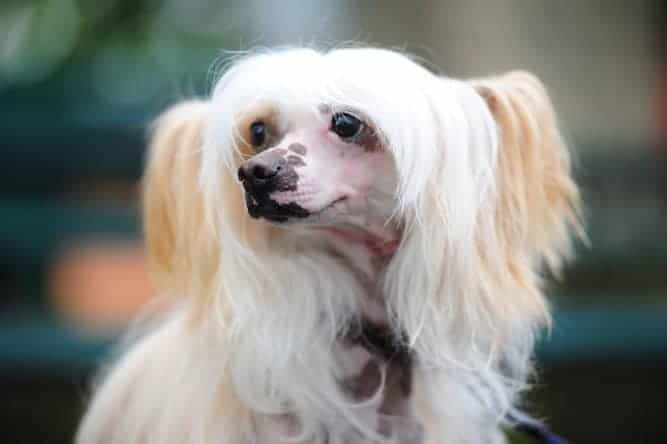 The Chinese Crested temperament makes for a super-sweet, gentle soul. Chinese Crested pups can be a bit more high maintenance than other breeds, though, due to their sensitivity. For instance, you can’t scold him much while training him, or he may never forgive you. Instead, praise him and offer him a treat when he does well. While the Chinese Crested Hairless doesn’t have any hair, he still requires an extensive grooming regimen to keep his skin safe. He’s prone to sunburn, infection, and allergies and requires lotions and ointments to stave these things off.